I’m not due into Weta until Wednesday, but I went in today to watch dailies and get oriented with what is going on with the project. Everything at every stage of production looks outstanding. I got there for the Gollum dailies, but Susie, the 3D coordinator, asked me to stick around and watch the other department’s dailies as well. There’s a scene with Olyphants, another battle scene with Orcs on Wargs, and a bunch of Massive sequences at Helm’s Deep. Massive, for those of you unaware, is the crowd control system that Weta created. Its an insane program where every character in the scene has a simple brain that is programmed to do a specific function — sounds simple. But no. The character makes decisions based on what is happening around him. He can see and hear other people around him and determine whether or not that person is a friend or foe, and act or react accordingly. This allows Weta to create armies of thousands without actually having to animate all the individuals. This has all been published in Cinefex, so I feel confident in letting you know. I head back to the hotel after dailies and pick up some pancakes and a steakburger for Jennifer and I, respectively.The pancakes are halfway between Bisquik and a crepe. I wonder what the process is that makes them different. Its just flour, egg, salt, water and yeast — in the States its easier — Bisquik and water (eggs for fluffier cakes). As far as the Bacon and Banana situation — I passed on the bacon, but decided to risk the bananas. The bananas are, in fact, NOT in the batter. The banana is split down the middle…within the peel…and then fried. Its an acquired taste — one that I probably won’t acquire. However, I have befriended the owner of the City Street Cafe — an older woman of perhaps Persian decent. She tells me that she will make whatever we want her to make. She has been to the States before — to Las Vegas — evidently the Land of Pancakes. She is sure that she can make them just as good as back home. She is very sweet, and we become loyal customers for our entire stay. The “steakburger” at the Canal Club in Venice is actually ground sirloin (and very tasty). The “steakburger” here is exactly what is says — a piece of steak in a bun. Still tasty though. Out of curiousity, I look up the etymology behind “burger” to find out if ground up food on a bun defined one. I find that Hamburger originate from the German city of Hamburg in the late 1800s. We ultimately dropped the “Ham” and now burger can be used with anything. Cheeseburger, Vegiburger, Turkeyburger, and yes, Steakburger. 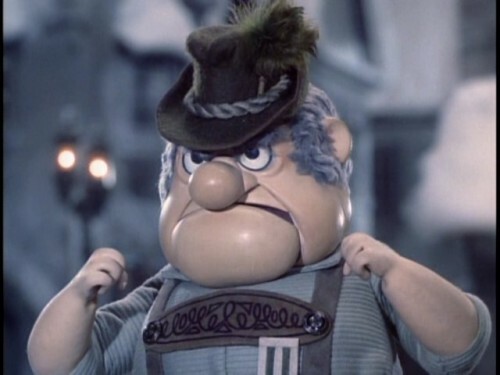 I could even throw in the toy-hating Burgermeister Meisterburger of Somberland who tried to prevent the young, svelt, red-haired, Kris Kringle from delivering toys to all good girls and boys. All in all, you throw some kind of food filling onto a bun (slices of bread would imply “sandwich”) and it is automatically a burger. Restaurants have three categories in New Zealand: Licensed (serve liquor), BYO (obviously, you bring your own alcohol), and unlicensed (uh…yeah, that). All restaurants that serve alcohol are explicitly labeled as “licensed”. In going to the City Street Cafe – licensed- to order our food, I notice lots of signs dedicated to alcohol consumption and sales rules. Like, you can’t take the alcohol you order with you when leaving the restaurant. This is nothing big, most places in the States have laws about open containers. But, last Friday, we saw plenty of people walking around with open containers. So, I’m wondering if this rule is specific to the restaurant. The next rule dictates the hours at which alcohol may be sold. You can order booze from 8am to 1:30am. It makes me feel good that there are such rigid drinking rules. After all, you wouldn’t want people to be drinking in their sleep. Since we are at a restaurant, I’ll comment on tipping practices in New Zealand. It’s non-existent. Nobody expects to be tipped for providing good service, and no one is upset or hurt if you don’t. Jacqui informed us that we should only tip if we get absolutely exceptional service. Evidently, waiters and waitresses get paid enough that they are not dependent on tips to make a living. As you can calculate, this saves 15% of everything from hotel service, to taxis, to restaurants, to pizza delivery guys. However, Jennifer and I are good tippers, and we like to tip to show our gratitude. And you know what? When we went back to a restaurant, we not only received excellent service, always, but we were treated with special service, like the ability to order takeway food when its not the restaurants policy, served dishes that they were experimenting with, and offered complimentary drinks. I’m not saying that for people to tip all the time. In America, servers come off with an attitude that they are entitled to a tip. In New Zealand — they actually, sincerely, appreciate your appreciation. A-Team — that crazy Murdock is at it again! I feel like I’m in Junior High again. The only thing that would make it perfect is if Wonder Woman came on. Linda Carter flying an invisible jet in her stars and stripes outfit is more than one American boy can take. The Virginian and Mod Squad also came on. A bit before my time, but good ole stuff none-the-less.